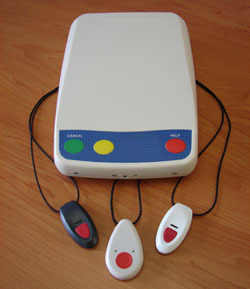 The VCi MK9 Carephone ™ Personal Response System (medical alarm system) has been tried and tested in many tens of thousands of homes and in residential aged care accommodation. No programming is required at the time of installation and it is equally suited to applications where calls are received by a 24 hour monitoring service, or where calls are sent to direct responders. The equipment can be supplied with a custom designed front panel label allowing unique branding, and other customer specific information such as a phone number etc. The current model, the MK9s, is the latest revision of this very successful product and includes many new features intended to enhance functionality and lower total cost of ownership. Remote programming/reprogramming of the customer configuration (CONFIG) file from any telephone or during the voice phase of an alarm call. The customer CONFIG file holds settings for phone numbers, alarm ID information, alarm data format (Ademco FF or Contact-ID), speaker volume, pre-alarm volume and duration, telecom network compatibility options, wireless pendant settings, security/telecare wireless sensor Contact-ID identifiers, settings for reminders and automatic check-in and auto-reporting functions. A downloadable activity history log which stores up to 500 alarm events, including mains power and telephone line outages and other technical information. Pendant/trigger low-battery status warning to the user. An optional real-time-clock-calendar for very accurately timed reminder functions such as pill reminders and “Im OK” daily call reminder functions. Optional voice announcements to the user and to direct responders. A USB programming tool for easy workshop or field reprogramming and activity history log download. Plus other features too numerous to list here. The VCi MK9s Carephone ™ uses high quality components throughout and provides unparalleled levels of reliability and durability, particularly important when peoples wellbeing depends on correct operation of the equipment, and when a service provider retains ownership and is responsible for its ongoing operation, maintenance and recycling. The MK9s meets, and in many cases exceeds, the requirements of Australian Standard AS4607:1999, and all other Australian and New Zealand regulatory requirements. The equipment is approved for connection to the Australian and New Zealand Public Switched Telephone Network (PSTN). The equipment may also be connected to telephone services provided over high Quality of Service (QoS) Hybrid Fibre Cable (HFC) networks, correctly configured National Broadband Network (NBN) customer equipment, and high QoS VoIP networks. Please contact VCi for further information.